Sales contests around face-to-face meetings can be game changing. Seriously. They allowed Kelly Services to generate an additional $5.8 million in 60 days. (Get that story here.) And the Kelly team isn’t alone in recognizing this. Of all the contests our clients run to reward activities related to meetings, those around landing face-to-face meetings hold “most popular” status. It makes sense, too. A lot of sales leaders believe in the power that comes with getting in face time with prospects and customers, and a whopping 95% of people surveyed by Virgin say face-to-face meetings are essential for long-term business relationships. The challenging part? Getting sales teams to focus more on these meetings, considering the seemingly more convenient options they have for communicating with prospects and customers with technology. Running a few sales contests around face-to-face meetings can help. Prize Ideas: A team trip to one of the featured team’s games; or for a less expensive incentive, a themed party at work around the sports team, where everyone wears game gear, that team’s song is played, food falls into whatever theme works with your city, etc. Point Structure: Give the team 100 points for each face-to-face meeting they’ve scheduled in the last 2 weeks, and they’ll begin the contest with this score. (Note: This only works well if you’ve already been motivating your team around getting more of these meetings; then you’re launching this by rewarding the team for what they’re doing when not in the spotlight, too. The number you get here also offers a good baseline; compare it to the number of meetings you get in the 2 weeks during the contest, and you’ll understand contest impact.) When the contest launches, give the team 100 points for each new meeting booked during the course of the contest. Play an early ’00s song each time someone scores during the contest. Does your sales team need to focus more on face-to-face meetings? 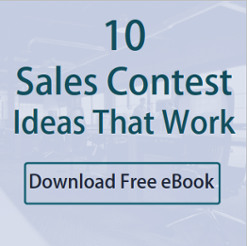 Check out these 6 sales contest ideas.